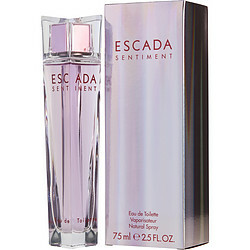 Escada Sentiment is one of my very favorite fragrances of all time. Wish I could still find it in the stores. Was glad to find it here. Escada Sentiment is wonderful. I love it, but have had trouble finding it in the last few years. I purchased Sentiment for my Valentine's gift to myself this year and I hadn't had my Sentiment in a long time and finally got a chance to own it once again. I just love this perfume! !